(leading to ExpertRating ExpertRating Guided Reading: Strategies for the Differentiated Classroom Skills Certification). This course includes a knowledgeable and caring instructor who will guide you through your lessons, facilitate discussions, and answer your questions. The instructor for this course will be Marsha Spears. About the ExpertRating Online Teaching Course (Guided Reading) instructor : A veteran educator who has taught every grade but third, Marsha Spears has spent 35 years teaching students and training teachers. Spears earned a bachelor's and master's degree in educational administration with a specialty in curriculum and literacy development, training that would prepare her to take on the toughest of classrooms. And tough classrooms are where she made her mark, helping a wide variety of at-risk learners read with renewed confidence. Over the years, thousands of students and teachers have learned how easily they can incorporate Spears' reading techniques and activities into their daily routines. ExpertRating Guided Reading: Strategies for the Differentiated Classroom requirements: For taking this instructor led ExpertRating Online Teaching Course (Guided Reading) you need Internet access, e-mail, and the Microsoft Internet Explorer or Mozilla Firefox Web browser. "Wow, I loved this chapter!! Thank you, Marsha. I would love to meet you and share experiences. My goal at school this year has been to try to get my teachers to buy into differentiation of instruction. "NO TIME! NO TIME!" This is the common theme. Thank you for giving such quick practical suggestions that can be implemented in five minutes or fifty-teacher's choice! …For those of you who are not currently teaching, this course has been one of the most logical and practical that I have had. Start now making things for your future classrooms. I believe I remember one of [my classmates used] these ideas with [their] own children…Again, thank you Marsha. "wonderful ideas!" ExpertRating is one of the world's only ISO 9001:2015 Certified companies (from TUV America) offering an Online Teaching (Guided Reading) Course (leading to ExpertRating Teaching (Guided Reading) Skills Certification). When you choose the ExpertRating Online Teaching Course (Guided Reading) you can be sure that you are buying a premium International certification that is recognized by hundreds of employers and Government bodies in the US and other countries. With ExpertRating you get certified quickly online and you are equipped with a store house of information through the in-depth ExpertRating Online Teaching Course (Guided Reading)ware which has been developed by experienced Entertainment Industry Experts. You can buy this ExpertRating Online Teaching Course (Guided Reading) leading to Teaching certification at a special offer price of only $129.99 which includes the in-depth ExpertRating Online Teaching Course (Guided Reading)ware and exam fee. This is the best value for money Teaching Program available till date. You get the following services within the USD $129.99 fee. In-depth ExpertRating Online Teaching Course (Guided Reading)ware including scenarios and case studies. The process of getting yourself certified is very simple. 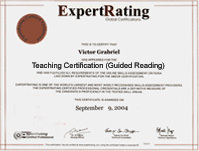 All you have to do is buy the ExpertRating Online Teaching Course (Guided Reading) for $129.99. Log in to the instructor led course using your password. Go through the ExpertRating Online Teaching Course (Guided Reading)ware (which would take you 6 weeks) and complete the final Teaching Certification exam at your convenience. You can complete the exam within 2 months of buying the Teaching Certification. The result of the exam appears as soon as it is completed, and your Teaching Certificate is mailed immediately. Chapter assignments to help you practically use the teaching concepts that you will learn during the Teaching Course. The final exam is fully based upon the ExpertRating Online Teaching Course (Guided Reading)ware that is provided along with the Teaching Certification. If you have gone through the courseware properly you should not have a problem clearing the exam. The exam consists of multiple choice questions from all chapters of the ExpertRating Online Teaching Course (Guided Reading)ware. Guided Reading will help even the most challenging student to develop, use and improve their reading skills in a supportive setting. As a teacher, it is your duty to take care of the individual needs of your students and monitor their skills and developments. Guided reading and writing are crucial components of a balanced literary program. This is a useful course for teachers that will guide them on how to develop strategies that will help the pupils to read and write independently. Guided reading and writing empowers the students and boosts their confidence and reduces the anxiety levels of the teachers and parents. The Guided Reading and Writing course will enhance the reading speed and improve the fluency of your students. The ExpertRating Guided Reading and Writing Certification course will provide you tips on how to teach reading and writing skills and give concentrated support and guidance to their students. Have you ever wished you had a good way to reach your struggling readers? If so, you're probably ready to discover the secret that thousands of teachers are already using to transform their reading instruction: differentiated instruction combined with guided reading. This first lesson will take a first look at it, and will explain how blending these techniques will help you build a balanced literary framework that helps your students negotiate a variety of texts with success. The first step in helping your students is getting to know who they are and how their minds work. In this lesson, you'll learn how to evaluate your students' readiness, interests, learning profiles, and social elements. Then you can use this information to drive meaningful, focused instruction that will help them see reading as a pleasure rather than a chore. Assessment is at the heart of differentiated instruction because you have to know where your students are before you take them somewhere new. In this lesson, learn how to plan quality pre-, ongoing, and summative assessments that will give you a clear picture of student learning. The best part of assessing students at multiple intervals is that you can tell what is working and what isn't, adjusting teaching strategies as you go. This lesson will discuss flexible groups, which are a mainstay in the differentiated classroom because they allow you to combine students for different reasons on different days. Sometimes you'll combine students based on interests and other times based on readiness or learning profile. However you use flexible groups, you'll appreciate the way this technique lets you accommodate a diversity of students. When it comes to selecting the texts you'll teach, there are literally thousands of options. However, you can narrow them down considerably by understanding the criteria of good fiction and nonfiction texts. You'll be picking the right texts the first time after this lesson finishes. Did you know that a lot of the learning process hinges on what you do to prepare students before they actually start reading? That's what will be discussed in this lesson. It's easy to just introduce a text and let students have at it, but if you plan the time before reading with activities that build anticipation and ground the text in prior learning, you'll be amazed by the results. How students read a text is a highly personal matter, but in the classroom, you have to direct reading to get the greatest results. In this lesson, you'll learn how to teach students the right way to read, to comprehend what they've just read, and to make inferences. The ultimate goal is helping your students have truly meaningful interactions with the text, and this lesson has got just the tricks to help you through. Does learning end when students put a book down? Hope not! The time to really help students process the text and extend their learning in new avenues is after students finish reading and have the chance to start thinking for themselves. This lesson will go over the after-reading framework, where you'll teach students to turn information into ideas as they go beyond the text and into the world. If you think of your classroom as a ladder, you'll realize that you have a lot of students on a lot of different rungs. This lesson will explore tiering, which is a concept that helps you separate students based on their readiness, interests, or learning profiles. The trick is doing so without making students feel like they're more or less competent than others. Are you eager for the secrets? You'll master them in no time! What do you do with those extra 10 or 15 minutes at the end of a lesson or a school day? An increasingly popular idea is to anchor your students to the material they've learned by extending learning in new avenues. You can do this with games, writing prompts, or any number of other fun, creative activities. This lesson will explore lots of great ideas. Your ultimate goal with the balanced literary framework is to create independent readers who are confident and capable of negotiating new texts with ease. In this lesson, you'll learn the basics of curriculum compacting, learning contracts, and individual projects, strategies to help your students transition to independence. You'll be amazed by how well students learn when they work more independently. This course will finish up in this lesson by discussing the foundation that you build for classroom learning. Your attitude is everything. (That almost bears repeating!) Beyond that, you need to be able to encourage struggling readers and help parents extend the learning at home. Once your foundation is strong, you'll notice that both students and parents take the initiative to build positive reading experiences.